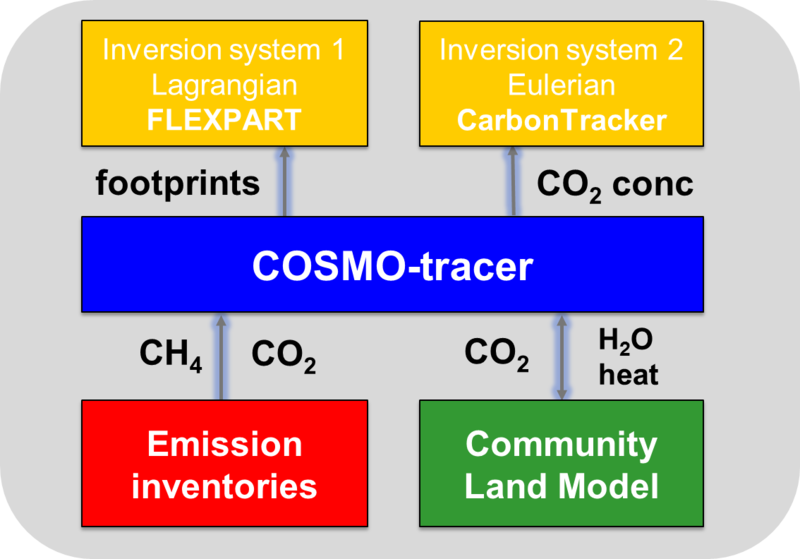 Two independent atmospheric transport and inverse modelling systems for CO2 and CH4 were developed within CarboCount-CH, both built around the COSMO model as illustrated in the figure. The first system model system relies on forward simulations with COSMO enhanced with a module for transport of passive tracers. 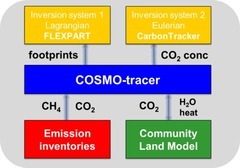 For tracer flux inversion, the model is integrated into the CarbonTracker Ensemble Kalman Filter Data Assimilation System (CTDAS). The second system is based on backward transport simulations with the Lagrangian Particle Dispersion Model FLEXPART-COSMO. For inverse flux estimation, either a Bayesian approach or an Extended Kalman Filter is applied. 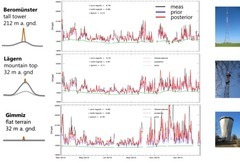 Both systems incorporate anthropogenic emissions developed within the project and biosphere fluxes from the VPRM model provided by MPI Jena as a priori fluxes. COSMO is the mesoscale numerical weather prediction (NWP) model developed by the Consortium for Small-scale Modeling under the lead of the German Weather Service DWD and with contributions from the Swiss Weather Service MeteoSwiss and other national weather services. COSMO is an advanced mesoscale NWP model used for both operational applications and research. In its climate-version COSMO-CLM, the model is used by a wide community of regional climate modellers. 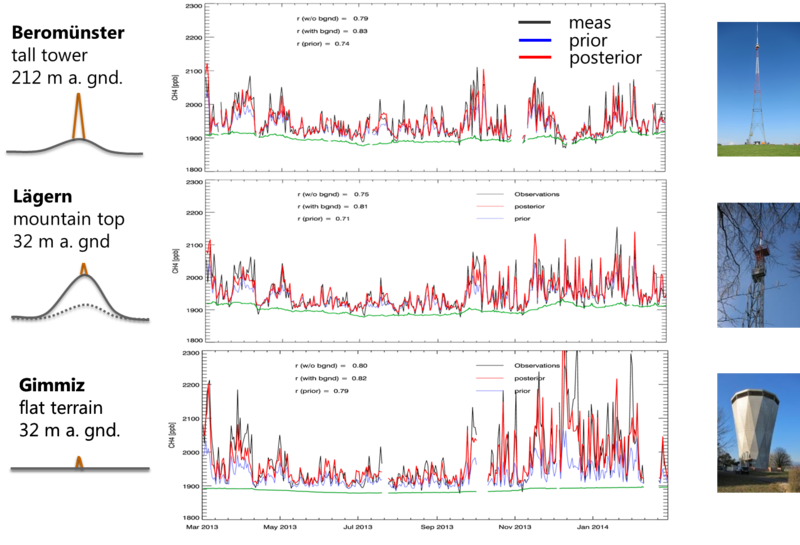 The performance of COSMO at the different measurement sites has been analyzed in detail by Oney et al. (2015). 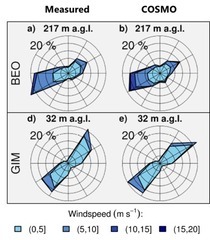 The figure to the right presents an example of this evaluation comparing measured and simulated wind roses at the two sites Beromünster and Gimmiz. 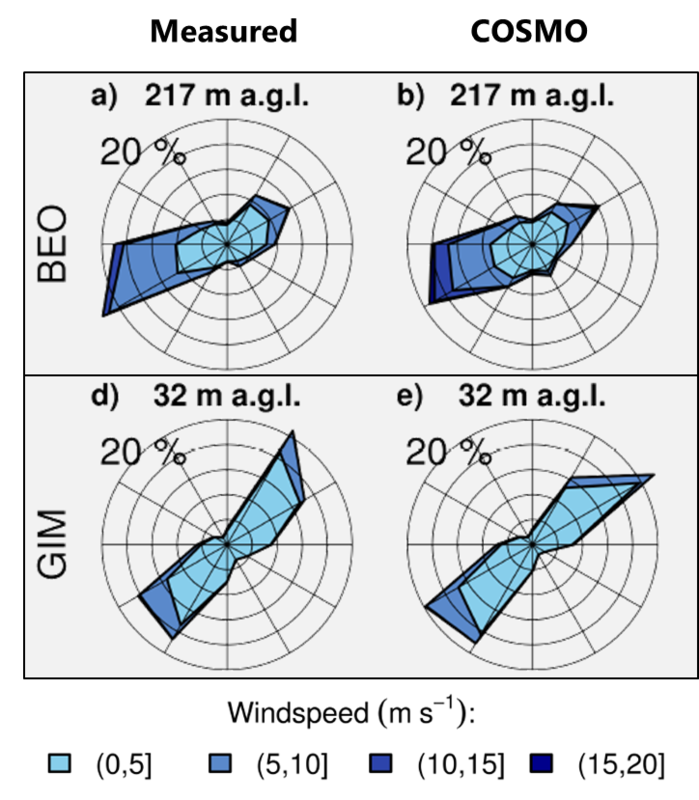 Overall, the model reproduces the observed distribution of wind directions and amplitudes very accurately. FLEXPART-COSMO is applied in backward mode to compute the sensitivity of a measurement to upstream sources (source-receptor relationship or footprint). Every 3 hours, 50'000 particles are released at each measurement site (from multiple heights above ground) and traced backward in time over 4 days. An example footprint is displayed in the figure to the right. The footprints can then be spatially multiplied with an emission inventory to compute the dry air mixing ratios expected at the site for the given 3-hour measurement interval. A comparison of simulated and measured dry air mole fractions is presented below for both a priori and a posteriori values. 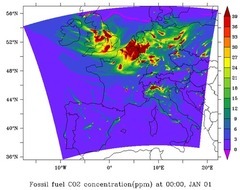 In order to simulate CO2 and CH4 as passive tracers, the COSMO model was enhanced with a generic but very flexible tracer module (Roches and Fuhrer, 2012) and modules for the echange of these gases with the surface. The tracer module has been fully integrated into COSMO version 5.0 and is now the standard mechanism for transporting all scalars in COSMO. Observations are assimilated into the model system using the CarbonTracker data assimilation framework to optimize surface fluxes. For this purpose, COSMO is run forward with a large number of CO2 tracers representing background mole fractions, anthropogenic CO2 released within the domain, and an ensemble of biospheric CO2 from perturbed biospheric fluxes. COSMO-CLM2-CN: COSMO model coupled to the NCAR Community Land Model with Carbon/Nitrogen cycles.